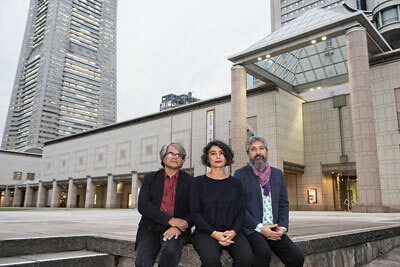 In November 2018, the Organizing Committee for Yokohama Triennale has announce the appointment of RaqsMedia Collective as the Artistic Director of Yokohama Triennale 2020. Since its inauguration in 2001, the Yokohama Triennale has strived to be a leading force in the Japanese contemporary art scene. Ahead of its 20th anniversary, the triennale seeks to reassess and shift its position by joining forces with RaqsMedia Collective, a New Delhi-based collective consisting of Jeebesh Bagchi, Monica Narula, and Shuddhabrata Sengupta. Selected on the basis of its highly intellectual and polemical approach, the collective is notable for its originality and inquisitive attitude. Active as artists, curators, and producers, the group is versatile and collaborative, working frequently with architects, computer programmers, writers, curators, and theater directors. Among the major biennales and exhibitions they have curated are the Shanghai Biennale “Why Not Ask Again” (2016) and most recently “In the Open or in Stealth” (2018) at Museu d’Art Contemporani de Barcelona (MACBA). In the 19th century, Yokohama became one of the first Japanese ports to open to the outside world after a period of nearly 200 years of national isolation. Since that time, the city has remained open to untested ideas and unfamiliar knowledge. Acutely aware of local issues, RaqsMedia Collective will function as creative agents, finding “polyglot anchors that translate and poetically amplify” the triennale’sconcerns, including subjects with specific global and social implications.